Yes, Florida suffered from an unprecedented number of hurricanes and tropical storms in 2004, and 2005 is looking like it will be more even more terrible. Worse than that for me, however, is that I have signed up for a weekend dive trip off the coast of Jupiter Florida. Now, a day before the trip starts, it appears certain that the trip will be called off. Choppy seas, awful visibility below, torrential rains. Nevertheless, I drive down to Jupiter blindly optimistic. I have no idea why. Somehow, dumb luck is on my side. The dive trip is stupendous. We enjoy perfect weather. The seas are lying down flat. The water is warm enough that I am able to wear my “shortie” wetsuit (although there is a noticeable “thermocline” of cool water I notice when I drop below about 30 feet). The visibility is acceptable. One would never know that a tropical storm has just passed by the area. We do six dives in less than two days — a rather large number in such a short period of time. Fortunately, on the day before, I am talked into using “nitrox” gas in my dives. I’ve never used nitrox before, but am told that it is growing in popularity in the scuba world. Nitrox contains a higher percentage of oxygen than ambient air (about 35 percent instead of about 21 percent). For divers, the attraction of nitrox, I am told, is that more oxygen means the diver can stay at depth for longer periods — more time to enjoy the reefs and marine life. And best of all, for me at least, is that diver fatigue is reduced substantially. Without the nitrox, I’d be flat on my back for days, following 6 dives in 36 hours. With the gas, I’m ready for ANOTHER 6 dives. In all of my enjoyment of using nitrox for the first time, I fail to consider an unfortunate equipment glitch. My dive computer — while a device I’ve always found pleasurably reliable — was designed for regular air, and not the recently emerging nitrox gas. So while I was happily enjoying more safety and longer dive times, my faithful (and suddenly obsolete) computer was presuming that I was, as always, using conventional air. As a result, for the first time in over 100 dives, I reach the surface after my 3rd dive and my computer is not at all happy. Indeed, it is madly, frantically beeping and flashing a terrifying “SOS” message. The poor little outdated computer is screaming at me that I’ve exceeded my “decompression stop” limits. My computer thinks, erroneously, that I need to stop at 15 feet of depth for 19 minutes before surfacing in order to outgas nitrogen in my blood. Ordinarily, this kind of “deco stop” miscue means the diver has a very good chance of ending up with a terrible case of the bends due to wildly expanding nitrogen bubbles. But this little hitch hardly puts a dent in this otherwise wonderfully memorable dive trip. Highlights of the 6 dives? Thick clouds of synchronized bait fish. 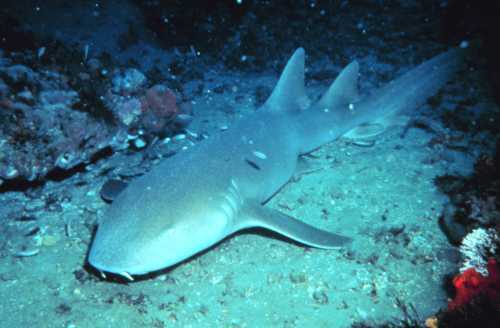 Lots of nurse sharks (totally harmless, yet incredibly graceful and fun to see). 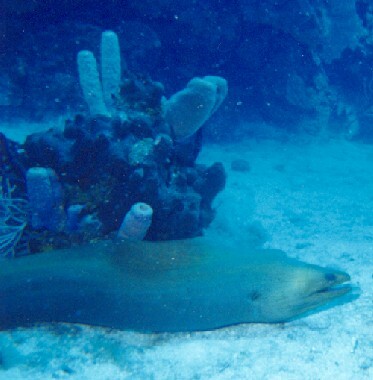 An abundance of very large green moray eels (some the size of telephone poles, as the photo shows) poking their squirming heads out of coral formations, and menacingly snapping their sharp-toothed mouths open and shut to intimidate any potentially hostile attackers. 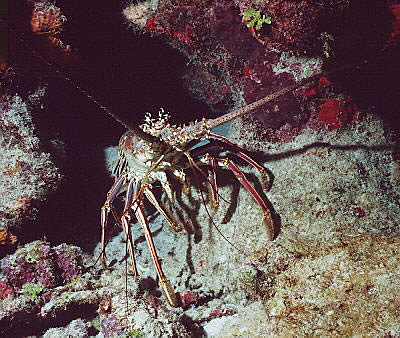 We also have the pleasure of seeing an enormous number of large-antenneaed lobster (see above), some colorful queen angelfish, schools of barracuda, and some extremely large loggerhead and hawksbill sea turtles. On one of our dives, we come across a 400-pound turtle resting at 70 feet with two 4-foot long remora’s attached to her back. Our average depth is about 75 feet. 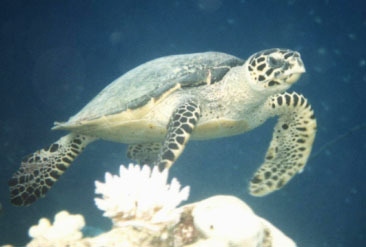 The strong current means that we expend very little energy as the current pulls us along the coral reefs. We just effortlessly glide by in total silence as the colorful reefs and vibrant marine life pass before our eyes. On one of our last dives, on my request that we dive a shipwreck, we dive what is called the Jupiter Wreck Train. We descend to 80 feet. Before us is an eerie, ghostly sequence of wrecked ships. In a single 40-minute dive, we casually inspect 3 ships lying wrecked at the sea bottom about 90 feet down. They sit within view of each other, and we just let the current take us to each. It is particularly enjoyable to go to the third ship, as it has a lot of portals and open doors that allowed us to swim through the interior of the fairly large ship. Coolest of all with this ship, though, is the fact that it is the home of what is known as GOLIATH Grouper (formerly known as jewfish). The name of this spectacular fish is particularly apt. It is hard to describe how astonishingly HUGE these guys are (the photo shows a diver swimming along side one that is about one third SMALLER than the ones we swam with). 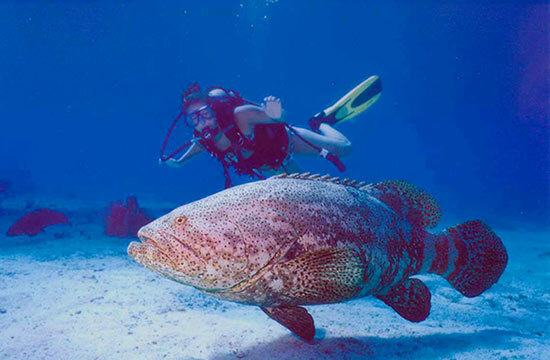 Imagine what a grouper would look like in prehistoric times living in the age of the dinosaur. Or imagine the SUV of fish. These whale-like beasts weigh a staggering 400 to 500 pounds, and are as big as a railroad car. They could swallow me like an M&M. One could eat fish like a king for five years if you caught one of these slow-moving monsters (they’re protected by law, fortunately). As I’ve said before, being certified opens up a whole new world that you have no idea exists down below. We live on an unbelievable planet!